Take your brunch game to a new level with these easy, cheesy, impossibly flakey gruyere biscuits! 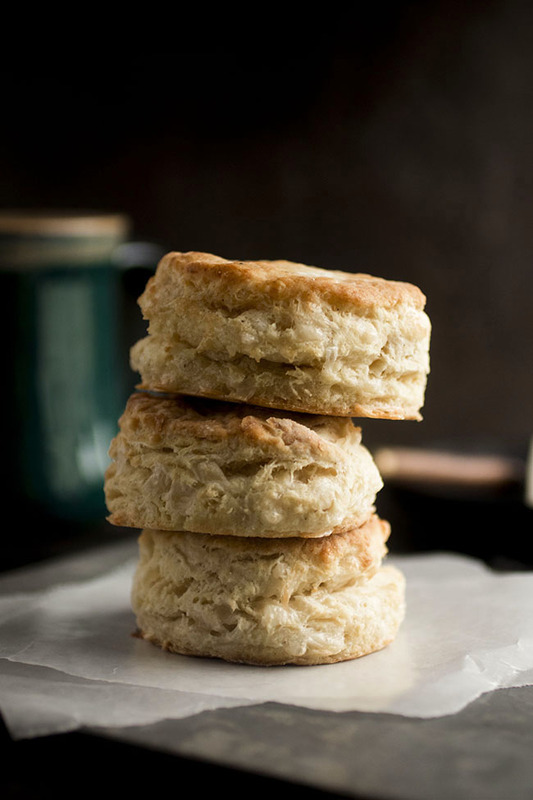 A perfect biscuit recipe for any occasion – and it’s ready in just 30 minutes! I know this is just a biscuit recipe, you guys. But I love biscuits so much (and this recipe was SO TASTY) that I feel like I should be writing this with Chariots of Fire playing in the background or something. You know what? I’m doing it. Please hold. AAAHHH. Ok. Out of all my blogging decisions, I’d say this is definitely Top 10. You know what else? Here’s the link. You have my permission to read this post with the Chariots of Fire theme song in the background. This is for realizes (FOR. REALSIES). going to be my new recipe development background music. Like, yes, you’re making dinner, but also, YOU ARE A CHAMPION. I know the interwebs are obsessed with those impossibly tall pancake stacks, but I fall much more into the “ALL THE BISCUITZZZZ” kind of breakfast camp. Pancakes and waffles are all well and good, but give me a flakey, buttery, melt-in-your mouth biscuit any day. Especially Saturdays. The key to a good (nay, GREAT! Because we’re Chariots of Fire Biscuit Champions) biscuit is stack after stack of flakey, pull-apart-y, buttery, yummmmmm-tastic layers. Some people are a little afraid of homemade biscuits, but I promise you they’re really not that scary! The tricks: Use COLD butter and milk, work quickly, and fold the dough over on itself a few times before you roll it out (but don’t completely smush it together). 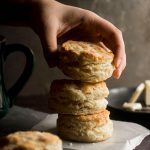 Biscuits are one of the rare cases where you DON’T want a smooth dough – the lumps and layers are what give biscuits their flakiness. 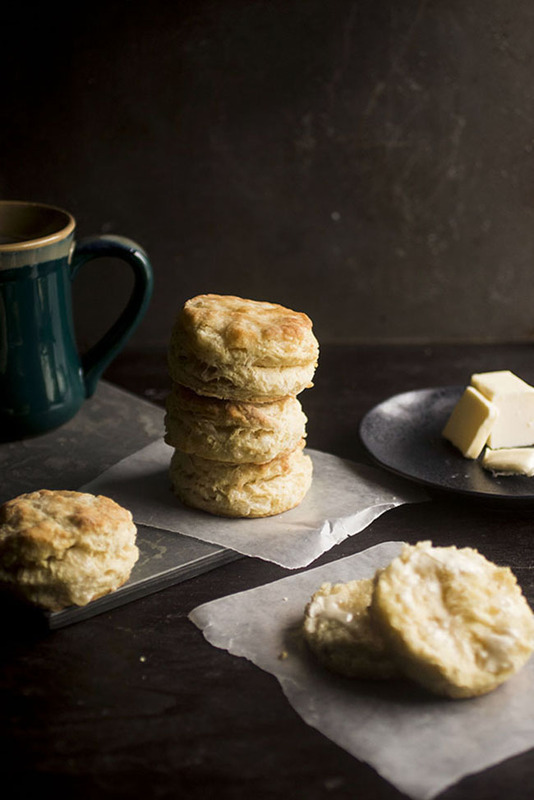 These particular biscuits are ready in just 30 minutes (and there’s cheeeeeeese in them). 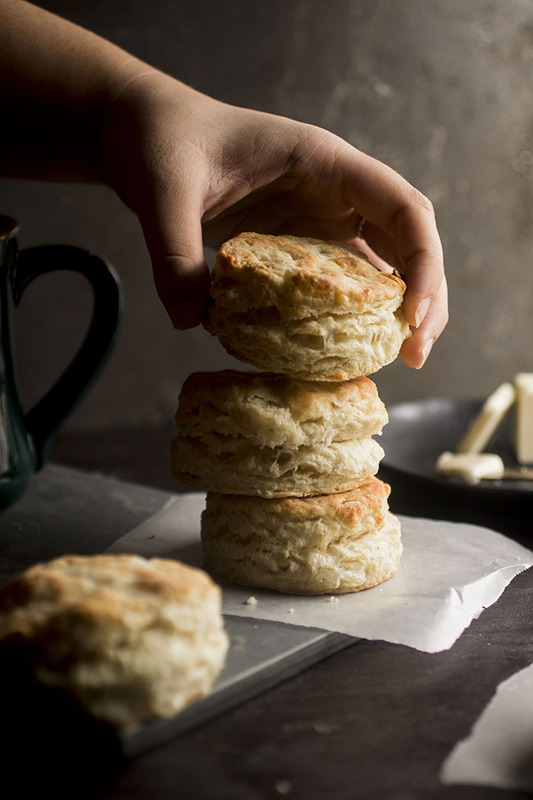 Also – if you want it bad enough and your biscuit-loving heart is pure – you miiiiight just get a beautiful, melty stretch of gruyere to appear as you pull that first golden, flakey layer off the top of your fresh-from-the-oven breakfast biscuit miracles. Top fresh biscuits with butter and honey, or use them as the base for some Cajun Eggs Benedict. These gruyere biscuits would also be amazing with some fresh rosemary or chives mixed in. 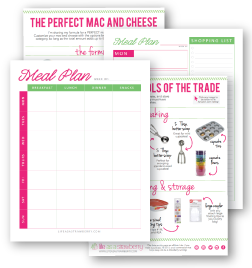 Use this recipe as your blank, biscuit-y canvas and let your imagination run free! YOU = GRUYERE BISCUIT CHAMPION. 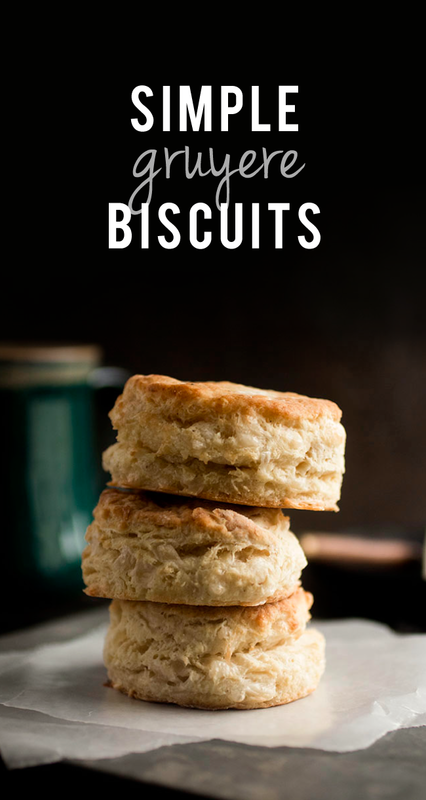 A simple biscuit recipe for breakfast or brunch. Stir flour, baking powder, baking soda, salt, and fresh ground pepper together in a large bowl. Add cold cubed butter and cut it into the flour mixture, using either your hands or a pastry cutter, until the mixture is coarse and resembles cornmeal. (If you’re unfamiliar with this process, you basically just quickly rub the butter into the flour with your hands until the mixture is coarse and the butter has been broken up into small pieces). Stir shredded gruyere into the flour mixture. Add milk to flour mixture and stir until everything is combined. The dough shouldn’t be completely smooth – we want to keep lots of butter pieces in there so the biscuits will bake up and be nice and flaky. Turn dough out onto a floured surface. If the dough is too sticky, gently fold a tablespoon or two of flour into it until it’s easier to work with. I like to gently fold my dough over on itself several times, so I have lots of butter layers working for maximum flakiness. Roll dough to about ½” thickness and cut biscuit rounds with a 2″ biscuit cutter. Place biscuit rounds on an ungreased baking sheet and bake at 450 degrees Fahrenheit for 10-15 minutes until lightly browned. Serve immediately with butter and honey. If you don’t have gruyere on hand, you can substitute sharp white cheddar. These biscuits would also be great with some fresh herbs mixed into the dough! These look like the perfect biscuit, Jessie! And I love your addition of gruyere cheese. I bet it was amazing! 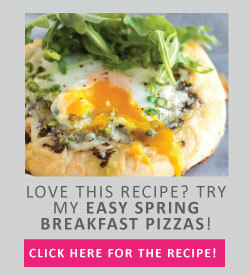 I’m so hungry right now and I just want to have this for breakfast. I’ve never made biscuits before either so I can’t wait to try it out. 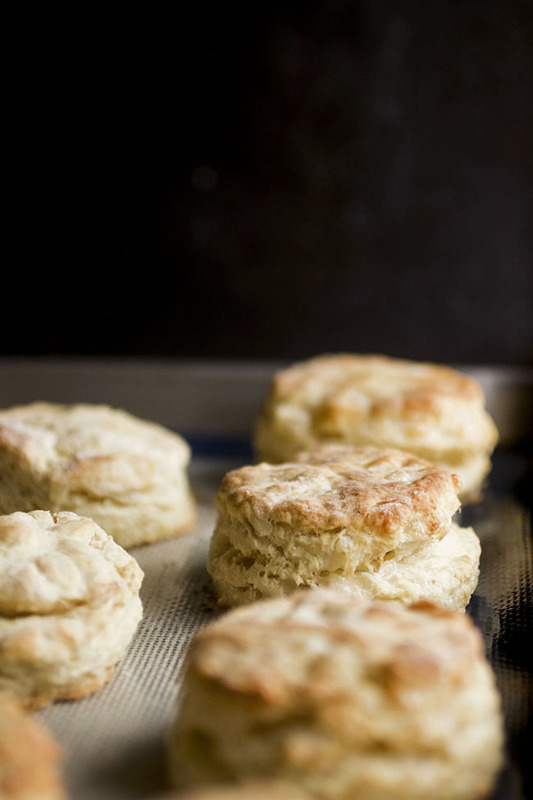 You’ll love making biscuits! Definitely give these a try and let me know how it goes! These look wonderful, Jessie! 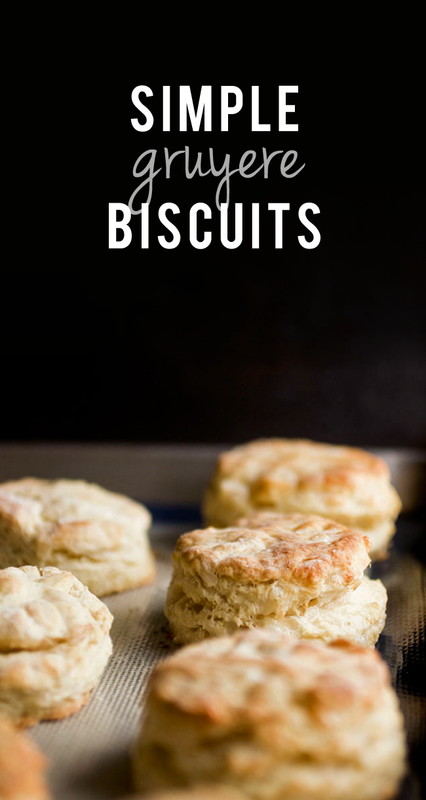 I have been working on a biscuit recipe and can’t wait to try these! Thanks for sharing. Hi Jessie! Could you use almond milk as well?